Versatile - Staircases, platforms, walkways, machine guards, and our patented Oakland Metering Loaders are included in a complete line of fabrications. The Oakland Metering Loader is operated with the minimum of maintenance and is available in sizes of 6 inches wide to 96 inches wide. Special designs of loaders and hoppers are also available. The hoppers are sized to have capacities to facilitate the least amount of loading for the capacity of the furnace or other type of equipment. The Metering Loader has a minimum of three loading steps supported between side plates riding in hardened guides which are integral to them. The steps reciprocate up and down at a 60 degree slope. During each upward movement, the lowest moving step elevates a number of parts from the hopper, discharging most of its load onto the second moving step. Step-by-step transfer continues until the last moving step is reached at which point parts are uniformly fed into the discharge chute. Reciprocating steps will deliver a virtually constant number of parts for working stock, regardless of part size. The loader is constructed with the minimum amount of moving parts. The side plates are constructed of 1/2 inch 1045 steel with the guide slots for the steps Flame hardened. The steps are fabricated from 1/2 inch abrasive or work hardening steel with the guides carburized. The loader is compact, floor mounted and space saving. The metering is controlled by a a timer or weigh control. The loader will measure loads for Belt Furnaces, Rotary Furnaces and Shaker Hearth Furnaces. 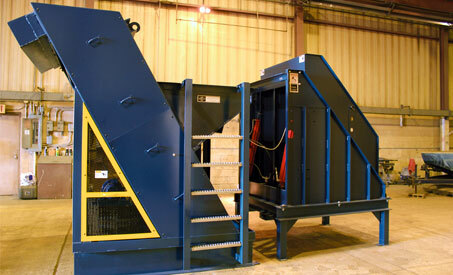 Also belt Washers, Rotary Washers and inspection conveyors. The Loaders come with hopper designed to the customers specifications, mounted control panel with main disconnect switch, reversing starter, manual and automatic selection switch, push bottom station, signal lights, relays and adjustable repeating timer for metering. Any additional timers or motor starters (if special equipment is added) can be mounted in the control panel. Step No.2 receives material from step No.1 while step No.3 discharges material from loader. Oakland Metering Loaders by means of reciprocating steps are able to meter parts ranging in size from small sheet metal screws to large forgings. Loaders will meter (+/-) 5% required pounds per hour and can pay for themselves in as little as three months. In all applications Oakland welding industries, Inc. Assumes full responsibility for proper engineering the loader to suit specific requirements. Dumper design consists of an enclosure to load the tote box and a overhead hoist to raise it through a vertical arc and empty it into the hopper. Unit is complete including all steel supports, enclosure for part, guards, overhead hoist and electrical station and all mechanical equipment. The purpose of a dumper unit is to keep the loader hopper loaded while eliminating the problem of material handling associated with forklift equipment. This system permits tote boxes to be handled at floor levels and provides automatic-mechanized material handling from tote box through the loader to the furnace or washer. Washer: Capacity in lbs. per hour Diameter of drum Density of parts Center line height of washer above flooring.